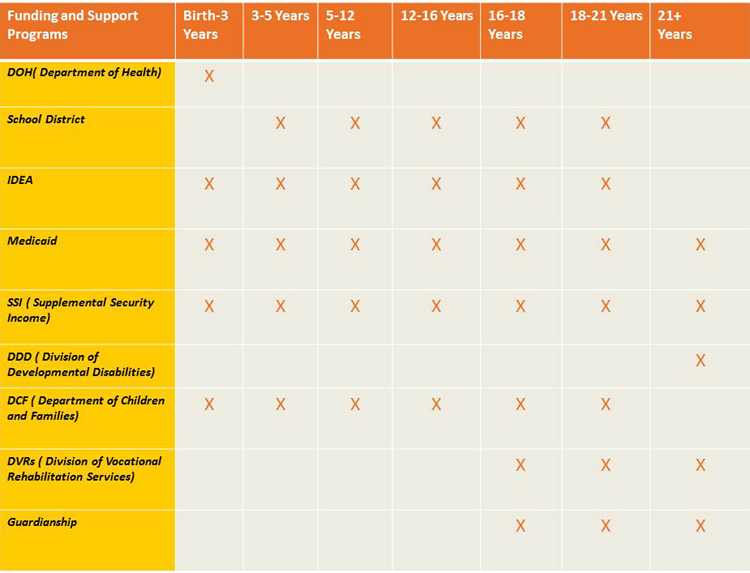 What is Special Child Health Services? Each of the State’s 21 counties has a Special Child Health Services Case Management Unit jointly funded by SCHS and the county freeholders. SCHS Case Managers, with parental consent, work with the child’s parents and the physician to evaluate an affected child’s strengths and needs; and develops an individual service plan for the child and family. Medical, educational, developmental, social and economic needs of the child and family are targeted. To be evaluated for eligibility, you need to submit a referral. A referral is a written request for an evaluation that is given to the school district when a child is suspected of having a disability and might need special education services. There are a few different individuals who can make a referral. If you believe that your child may have a disability, you may refer your child for an evaluation . You may contact the New Jersey Department of Special Education at 609-292-0147. The Individuals with Disabilities Education Act (IDEA) was established by the government to ensure that children with disabilities have instruction that meets their unique needs. The IDEA is the federal law that requires public schools to provide a Free Appropriate Public Education to children with disabilities. Medicaid provides health coverage to nearly 60 Million children, families, pregnant women, the elderly and people with disabilities. Click here to learn about what is Medicaid. In order to receive Division of Developmental Disability (DDD) services individuals are now required to be Medicaid eligible. Individuals new to DDD are required to have Medicaid eligibility before they can begin receiving a service. Individuals who already receive DDD services who are not Medicaid eligible must become Medicaid eligible to continue to receive services. Click here to learn more about why you need Medicaid. To apply for Medicaid please visit your county Welfare Agency. (Board of Social Services).Click Here to apply for Medicaid. SSI, or Supplemental Security Income, is a federal program that provides monthly cash payments to people in need. SSI is for people who are 65 or older, as well as blind, disabled people of any age, including children.Click Here to learn more about SSI. Click here to find out What You Should Know Before You Apply for SSI Disability Benefits for a Child. Why Do I need SSI? Supplemental Security Income (SSI) is highly recommended for individuals with intellectual or developmental disabilities who turn 18 years of age and expect to pursue supports and services through the New Jersey Department of Human Services' Division of Developmental Disabilities.Click Here to learn more about why you need SSI. How can I find a Social Security Office? The New Jersey Division of Developmental Disabilities provides public funding for services and supports that assist adults with intellectual and developmental disabilities (I/DD) age 21 and older to live as independently as possible.Click Here to learn more about The New Jersey Division of Developmental Disabilities. DDD's Application for Eligibility/Intake Package. Click here for the Children's System of Care Services Providers. Click here for more information on how to apply for Family Support Services. Click here to access the DVRS Online Referral Form. Click here to access the DVRS Printed Referral Form. Click here to learn more about Project HIRE which is a statewide employment placement and training program for adults with intellectual and developmental disabilities. At 18, all individuals, including those with developmental disabilities, reach the legal age of majority. This means that parents can no longer make decisions legally on behalf of their children, regardless of the nature of their disability and regardless of whether or not they still live with their family.Some families may want to consider guardianship as an option for their family member. A guardian is defined as “a person or agency appointed by a court to act on behalf of an individual”. Click Here for Guardian Fact Sheet. Click Here to read more about the role of a Guardian. Click Here for the Family Guide to the Guardianship Court Process. Click Here for PLAN/NJ Professional Sponsors Directory.